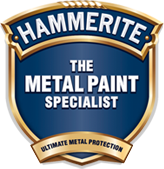 Clean surface by removing all loose paint and rust, dirt, grease and salt. Rinse with clean water and allow time to dry. By brush: apply direct to rusty area, working well into heavily pitted areas, corners and edges. Avoid coating onto painted areas. 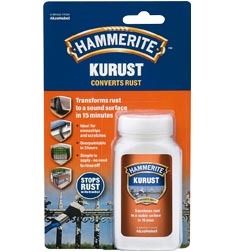 Hammerite Kurust will turn blue/black when reacting with rust. If it does not change colour in 1 hour re-apply. Apply topcoat after 3 hours. Special precautions should be taken to avoid inhalation of dust during surface preparation of pre-1960’s paint surfaces as they may contain harmful lead. 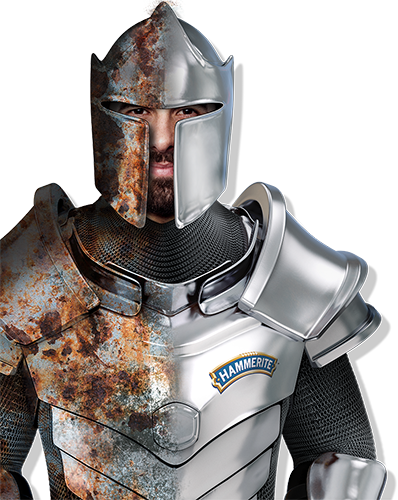 Hammerite Kurust should be stored in a dry, well-ventilated area. Protect from frost and direct sunlight.